Because of our commitment to quality care, pet owners have come to rely on Dr. Heather L. Sawyer and the professional team at Fieldstone Animal Hospital is compassionate and skilled partners in the care of their cherished companions. When a pet receives proper veterinary attention along with a loving home, he or she has the best chance of living a long and happy life. 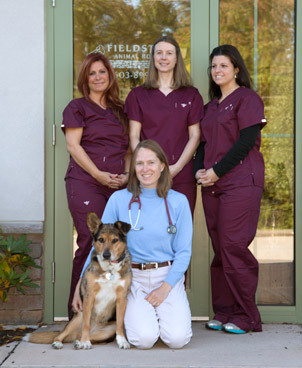 Fieldstone Animal Hospital reflects the best that veterinary medicine has to offer. We incorporate state-of-the-art technology, modern exam rooms, diagnostics, an in-house laboratory, and other medical assets into a facility that promotes a calm, welcoming atmosphere for you and your pets. We have served the Monadnock region of New Hampshire and our Massachusetts neighbors since 2008. An important aspect of our commitment to the health of your pet is our relationship with you, the pet owner. We recognize that in order to provide the highest quality of veterinary care, we must keep you at the center of all we do. We, too, are pet owners; we understand how important it is to be received by a staff that is welcoming, knowledgeable, and courteous. We work closely with you to understand your pet's unique health needs, develop a customized wellness plan, and ensure that you have the knowledge required to be a responsible, loving caregiver. It is our goal not just to ensure the health and well-being of your pet, but to be a partner in strengthening your bond. Despite the best care and nurturing, your pet may still develop an illness or be injured. Our internal medicine, surgical expertise, diagnostics, and laboratory follow-up, ensure that your pet will receive a quick and accurate diagnosis followed by the proper treatment. We discuss your pet’s diagnosis with you, as well as the various treatment options, so that we can move forward together with a healthcare plan. Please take a look at our website. Many of our animal hospital services are detailed, along with information about our doctors. If you have any questions or would like to schedule an appointment, feel free to give us a call at (603) 899-9535 or email us today. Mon, Tues, Wed, Fri: 8:00 a.m. - 6:00 p.m.
Thurs: 8:30 a.m. - 7:00 p.m.
Fieldstone Animal Hospital's fees reflect top quality care by our dedicated and highly-trained staff with an unsurpassed level of concern for your pet. Our goal is to provide progressive, superior veterinary medical and surgical protocols while remaining competitive in the local marketplace. We are happy to discuss our fees with you prior to initiation of medical treatment and will gladly provide you with a printed estimate. We require full payment at the time services are rendered. Deposits are required for select treatments and procedures. For your convenience, we accept credit cards, cash, Trupanion express and Care Credit.